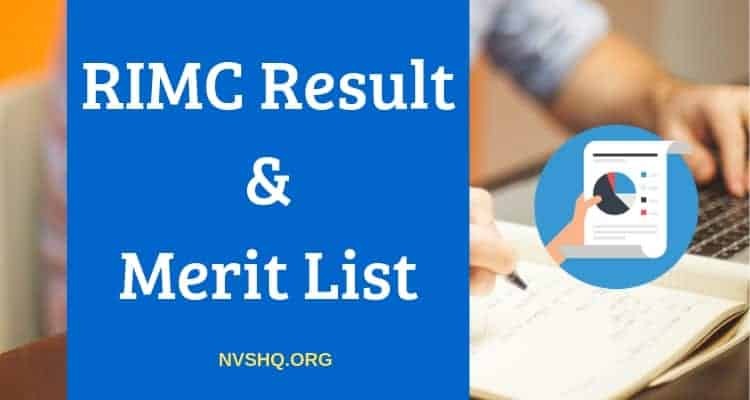 RIMC result & RIMC Merit list 2019: RIMC result of written test for July 2019 term admissions has been released now. Now students are preparing for RIMC interview round and after that RIMC final result 2019 along with RIMC merit list 2019 will be released. The written exam was conducted in the month of December 2018 and college has published the result on 15th February 2019. The result is currently available on the official website of RIMC and candidates who have appeared in the exam and were curious to know the result can check the result. The result has been made available in the form of PDF and hence there is no requirement of accessing the result by using any login credentials. Moving ahead in the article, readers will get more details about the RIMC result. 4 What after the declaration of result? RIMC result for written exam is now available on the official website of RIMC. Those who have not checked their result yet can visit the official website and check their names in the result list. As soon as RIMC candidates will check the result they will be able to know whether they have selected or not. RIMC result can be accessed only through the online mode. College does not send any hard copy/soft copy of result to any candidate through any medium of communication. If they have selected, then they can prepare for the next selection round i.e. the viva voce. Therefore, all the candidates who were waiting for the release of the result must check their result as soon as they can so that they can start their preparation for the next round. RIMC result for December 2018 result is published in a form of result sheet that includes all the details of the result. Candidates can view the result sheet only at the official website and also on this page. On opening the website, they will be landed on the homepage of the portal. At the homepage, they have to click on the “RESULT OF RIMC ENTRANCE EXAM DEC 2018” link mentioned under the Results Tab. RIMC result sheet will appear. Candidates can search their names under the respective state. Lastly, they can also download the result sheet for further references. As we have mentioned above that result has been released in a form of result pdf and anybody can check the result without any difficulty. Candidates have to find their names in the list. There is no need to enter any login credential or to provide any information to check the result. Anybody can check the result easily just by opening the result PDF link and view the details mentioned on the result sheet. Along with the names of the candidates, PDF will also include other details. Interview- The result for the first round (written test) has been released, the shortlisted candidates now will be called for the Viva-voce or interview round. The interview for this admission is scheduled on 4th of April 2019 (Thursday) at the respective states/UTs. Selected candidates will be intimated about the date, time, venue and related details by the government of the respective states. Candidates are advised to report at the interview venue on time. Any candidate who will fail to attend the interview round will be automatically disqualified from the admission procedure. The final merit list will be published after this round. Medical Examination- Those who will be selected at the interview round have to go through a medical examination. The admission of the finally selected candidate will depend on the medical examination. RIMC final result for admission to July term is expected to release in the month of May/June 2019. The final result will be published in the form of a state-wise merit list. The PDF of the final merit list will include- Names of the selected candidates under each state, roll no., father’s name, total marks obtained and remarks. Remark indicates whether the candidate is selected or reserved. The result sheet will also include some information about the medical at the end of the result sheet. Candidates and their guardians are advised to read the medical notice and other guidelines carefully. All the intimations regarding the admission will be forwarded to the candidates/parents through email, SMS or official website. RIMS result for July admissions is currently on official portal. Candidates can also check the result PDF from this page. The names of the selected candidates will be indicated in Bold font. The result indicates the names of the candidate state-wise and they can check their names in the select list. Selected candidates have to attend the viva-voce round in the month of April on the prescribed date. You can also comment below for any query.